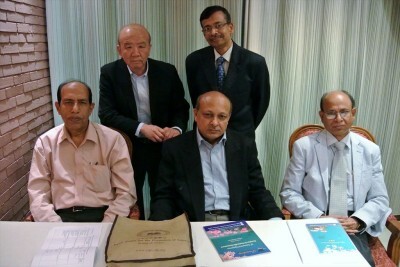 Bangladesh Japan Society for the Promotion of Science (JSPS) Alumni Association (BJSPSAA) held FY2014 Bridge Fellowship Program nominating committee meeting on February 28, 2014 in Dhaka. Prof. Kuniaki Yamashita, director of JSPS Bangkok Office joined the meeting as a nominating committee member. The BRIDGE Fellowship Program is provided exclusively for regular members of officially established JSPS alumni associations who have conducted research activities in Japan under the Postdoctoral Fellowships for Foreign Researchers or other JSPS programs. It gives them an opportunity to create, sustain and/or strengthen research collaborations with Japanese colleagues. After the just and transparent deliberation, BJSPSAA decided to recommend Prof. Dr. M. Jahiruddin, Bangladesh Agricultural University and Prof. Dr. A.T.M. 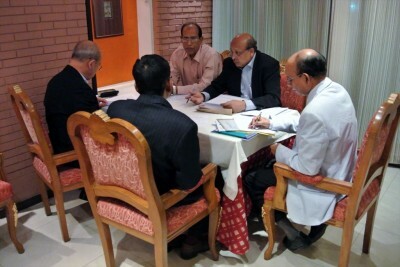 Zafrul Azam, University of Dhaka to FY2014 Bridge Fellowship from among the 9 applicants. Nominees from BJSPSAA are subject to be approved by JSPS headquarters.